So, now that you’ve seen what it can do, here’s how it was done… Oh, by the way, there’s a lot of pictures, so to save load time I’ve split the post across a few pages. Be sure to check out my updated version of the controller, which includes a touch screen interface! cost of the commercial solutions were beyond my budget for something I’d probably only do from time-to-time. But now that I’ve got into it, I must admit I’m quite hooked on it! I actually started this before all the other projects, and I’d completed it some months ago, but I hadn’t gathered enough time-lapse footage to demonstrate it’s use properly. I now have a couple of minutes of decent footage, so here goes. Enjoy. (Standard disclaimer applies, batteries are a fire hazard, wiring them up incorrectly can cause a fire, burning, etc., not to mention possible damage to equipment. Do so at your own risk, etc). 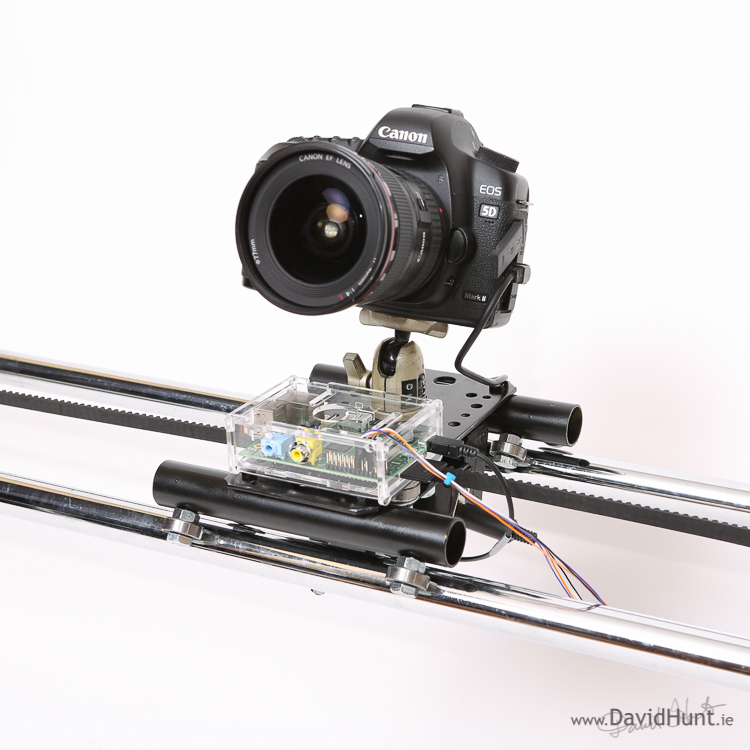 Here’s an image of the Canon 5D MkII on the DIY time lapse dolly, fully assembled, and ready to go. Here’s the finished rail in full. 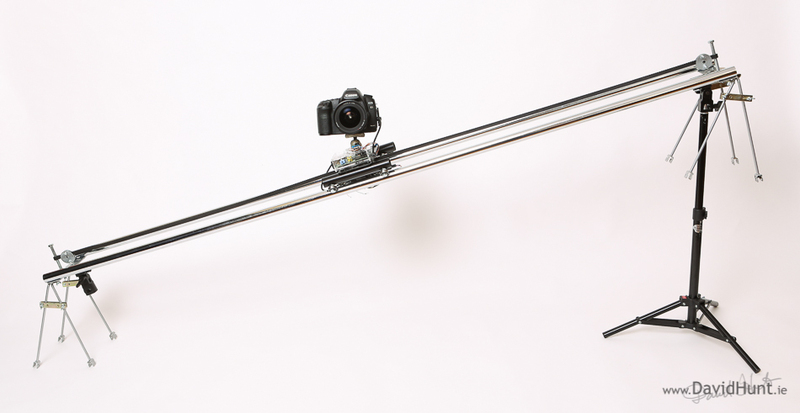 It can also take a tripod on each end, so you can do rising panning shots. I prefer the low level, wide angle pans, though. The tripod attachments are taken from a pair of salvaged hotshoe tripod mounts, normally used for mounting a flashgun to a tripod. I took off the hotshot part, and bolted the remainder onto the metal plates at ends of the tail. This gives me the ability to put one or two tripods under the rail for elevated pans. The construction was definitely the hardest part. Over the course of about 3 months, I’d do a bit, think about the next bit, do some more, etc. The legs were the last piece, as dragging along old buckets on which to prop the rail didn’t look cool AT ALL! I picked up the legs (some kind of wall hangers) at a local hardware store for €1 for a set of 2! Here’s a close up of the dolly, with the tripod head. It’s attached with some 1/4″ threaded bar and a nut. The Raspberry Pi in it’s clear acrylic case. It’s powered from a 8 x AA battery pack underneath the dolly, run through the 12v-5v DC-DC converter. The same battery pack drives the motor as well as powering the Raspberry Pi. For the power connector, I used a Micro-USB connector I salvaged off the same car charger from which I got the DC-DC converter. 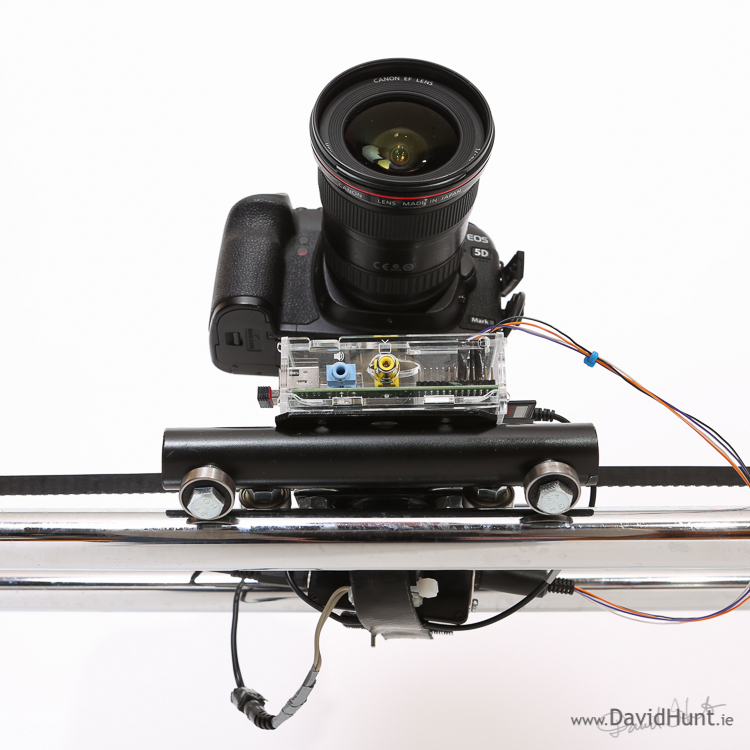 Another view of the Raspberry Pi on the dolly, this time with a Canon 5D Mark II. The camera is mounted on the head of an old Slik tripod which was too light for normal use, so I removed the head and made up a 1/4″ bolt to attach it to the dolly plate. This allows me to position the camera angle at any angle, and is especially important for the rising/falling pans. It’s important to keep the camera horizontal where there’s a horizon in view. A low angle shot, showing the skate bearings on the rail. Great work – must admit I’m in the process (and may be for some time) of building the same thing -taken some inspiration from the focus stacking project, and got the stepper motor bit working. Now need to build the hardware, though I’m planning to invest in an Igus rail – I presume you’ve seen the Chronos project…. This is incredibly neat! I just have a few questions: What program did you use to render the video? I presume ffmpeg? Also, how many shots per minute did you take? Thank you! The frames were stitched together using VirtualDub, which is a great little program for this type of thing. If you use threaded bar for this, then when rewinding the dolly, the nut on the threaded bar can overheat and seize, unless you cool it, bit too troublesome that with oil or coolant getting everywhere. Been there. Legs were in woodies, but they only had 2 left where I got them. Looked like some kind of wall hangers. €1 each! And eBay for the motor. Great writeup…where did you get the chrome ‘pipes’? Would it be possible to make a list of parts with their original purpose and where you got them from please? Just a wee bit more detail? I’ll try and get a picture of the timing belt clamps. It’s all made with what I had available to hand, or available in the local hardware store. Wikipedia has a very good explanation of what a Timing Belt is. Some of the images are just beautiful! Is it possible to get them in digital format to use them as desktop wallpaper ? As the timing for the shutter isn’t quite as critical as for the water drop shots, you could use gphoto2 to control the camera via usb. Thanks for sharing this, I feel inspired to try this myself and am wondering if you had considered trying curved pipes? I know that getting two pipes curved the same might require some metal fab equipment. But imagine the shot you could get as the time elapse pans over a shot with another axis in play. for the toothed pully and belt, try looking at the 3d printer spare parts on eBay. They are usually T5 pitch and can be bought together. I’m wondering if any of your shots used the whole length of the rail and if so, how long it takes to run the complete sequence. Obviously it would depend on shutter speed, but what would be a ballpark figure for a daylight shot vs a night shot? I’m also guessing you have to take your laptop with you to start the pi off and adjust the variables according to conditions? Would really like to put something like this together myself so just trying to figure out everything that’s involved. Thanks for the excellent post though! Rail length is 1.8m, so if you want 240 shots (10 seconds at 24fps), you’d move 1.8m divided by 240, or 7mm each frame. It doesn’t actually depend on shutter speed. If you’re doing 240 shots in day-time, and using 3 seconds between shots, that’s 12 minutes. If you’re doing 240 shots at night-time, and using 30 seconds between shots, that’s 120 minutes (2 hours). If you want to do a lapse with more frames, reduce the distance moved between each frame. 3.5mm will allow you to shoot twice the number of frames. I’m still a little confused. Does this mean you’re just using the camera in bulb mode and controlling the shutter with the Pi? Or is the camera setup, and the Pi just triggers the shutter and waits until it’s done? I would have thought if the GPIO pin was set high for a certain length of time, this would be controlling the shutter. And how do you configure it on location? Bob, Camera is triggered, and then waits. Then moves the camera, and triggers again. You need to be careful that the delay is longer than the shutter speed. Have a read of the Python code, and it might be a bit clearer. Thank you – what an outstanding project! very nice tutorial! By changing the track system you can have one with sleepers. This means that your track can be as long as you want. If you make it in sections then you can make a whole Hornby system and run it where you will. I’m planning on having the rPi trigger my camera as well, but it is a VERY long time since I last played around with electronics. Could you provide what transistor and resistor you have used? I pulled the transistor from an old PC PSU, so I don’t exactly know. It’s a beefy enough one, though. As for the resistor, I think I used 1K. Was there any welding required? Can you provide any more details about the motor. Is this a stepper motor, or just a standard dc motor? If its a DC motor does it have to have a certain RPM, or does it need to be geared down, how are you making it turn (and then move the rig) an accurate amount. 12V DC motor @ 15RPM. Pulse 12V to it each shot. Have a look at the code to see the pulse sequence. This is a very nice time lapse rig. I’m impressed by the build quality. In the Shutter Release circuit, what is the purpose of the NPN transistor? Is it used as switch? Yes, Kasper. It’s a switch. Thanks for the comment! Thank you so much for sharing this build, I just stumbled across it chatting with someone at work. As I see it you are only restricted to the pole size and timing belt length for Hzl movement? This has really inspired me, thanks once again from Brisbane QLD, Australia. I recently came across your blog and loved each one of the entries. I especially loved the things that you did with the Raspberry Pi. Awesome stuff! 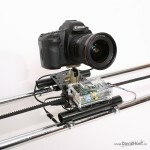 Now I am inspired to get on for myself and try the moving timelapse rig and the Drop Pi. I have a question: How did you wirelessly connect your PC to the Raspberry Pi.Did you use a wireless USB adapter? If so, then can you use it outside your home network? Thanks! Yes, wireless USB dongle, set up as a hotspot, so I can connect in with laptop, phone, tablet, etc. I am not sure I understood completely. Do you use a wifi adapter to connect the pi to the home network. And then do you ssh to the pi? Sorry about asking so many questions! No home network. Wifi in pi in master mode, then ssh direct to pi from laptop. Sorry short comments, on phone here. Also, where did you buy the timing belt and the pulley from? I am trying to look up that item, not sure what width I would need. When you keep the dolly slanted, what keeps it from rolling down the rail? Is it a geared motor, or is the teeth of the timing belt is strong enough to hold it. Pulley from eBay. 9mm wide should do. Geared motor, plenty of torque, but also a weight on a pulley to counterbalance camera. Great work mate, I love your precision and your neatness. Also, I admire your patience with replying to everybody’s questions and enquiries. Talking of which, I have one regarding your timing belt and cog combo, do you know the pitch of the belt you used and the diameter / no. of teeth in the cog? Or was it just a matter of grabbing a belt and finding a cog that fitted? Awesome, rail in progress will report back with findings and results. I’ve just hacked the remote for the 5d and obviously it has 3 wires, red, white and green (presumably +, – & GND) I’ve figured out that touching red and white together triggers the shutter. So that’s what I’ll be using in my circuitry but what should I be doing with the green wire?? I’ve noticed that if green’s wrapped around red then there’s no noticeable difference but if wrapped around white then the camera doesn’t show a preview of the shot on the rear lcd screen. If left out of the equation altogether, again, no noticeable difference. White is most likely ground, with red and green being shutter release and focus respectively. You don’t really need the focus for typical timelapses, as your lens will most likely be on manual focus. Rgds, Dave. Great David, thanks for all the tips. I m trying to control my Nikon through a cronjob calling gphoto2 every minute but I have to perform a USB reset after each shot. Would you have an easy solution at hand for this matter? Laurent, the latest version of gphoto2 has fixed this problem, version 2.5.2. Are you comfortable compiling the libs and binary from source ? I really find your work pretty inspiring and fantastic. I am definately planning on building a timelapse-rig myself but since you pointed out that your’s is heavy and awkward to transport I will make slight changes to your setup. First of all, I’d prefer more security for my camera to prevent the dolly from falling of the rail. 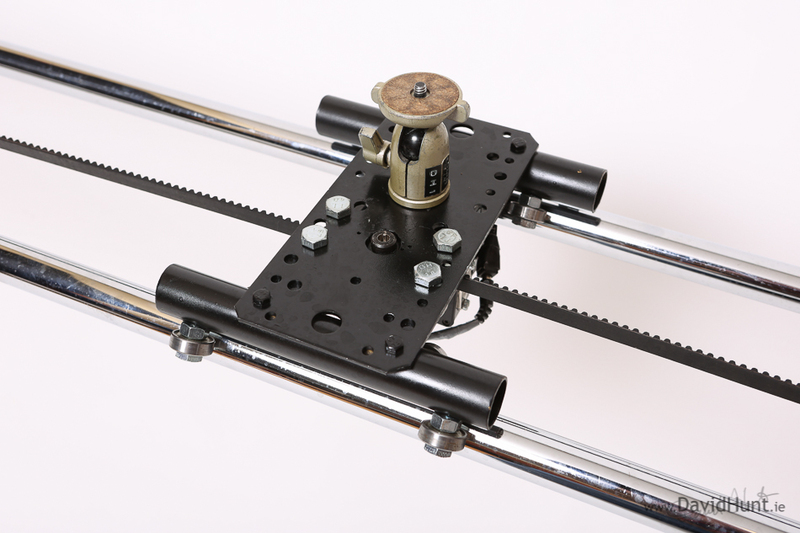 I was planning on adding some kind of security-catch or an additional set of skate-bearings under the rails, so that it’s impossible for the dolly to fall off when assembled. they consist of 2 tripods and 5 connectable tubes of 90cm length each . Using 4 tubes would make 2 rails with 180cm length each. Plus: If you work clever, you could still use them als backdrop-kit. What kind of dc motor do you use? Can you perhaps name the model? Thanks for the comment! It’s a good point about the rail, I was thinking of getting some pipes that screw together so I can transport easier. But finding pipes that are smooth when assembled are hard to find. Do yours give a smooth surface at the join? It’s not powerful to move the camera when the rail is at an angle, so I use a weight and pulley as a counterbalance. I am pretty sure that they are pretty smooth (but not 100%) when assembled but doubt that there should be any problems with the dolly. I can try and send you closeup picture of those pipes assembled, as well a pic of the stuff used to put the pipes together. Thanks for the specs of the motor! 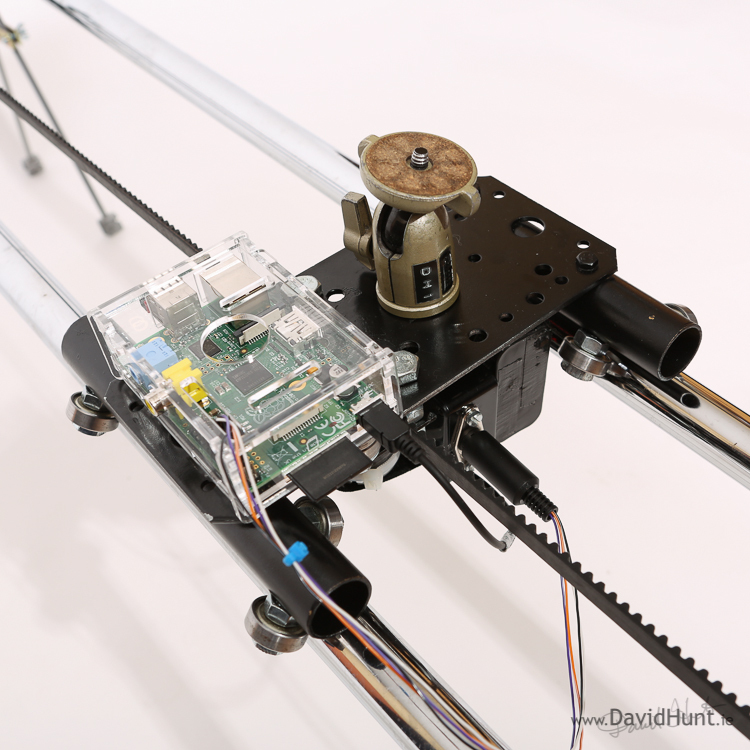 Have you ever thought of using a steppermotor to get accurate steps? Steppers require constant current for “holding” position, whereas in the DC motor there’s enough holding force to hold the position without current, so uses a lot less battery. I uploaded some pictures of the pipes and the connectors as well. a big plus is, that the pipes already have holes drilled in, so that you can non-destructively build a rail out of them.